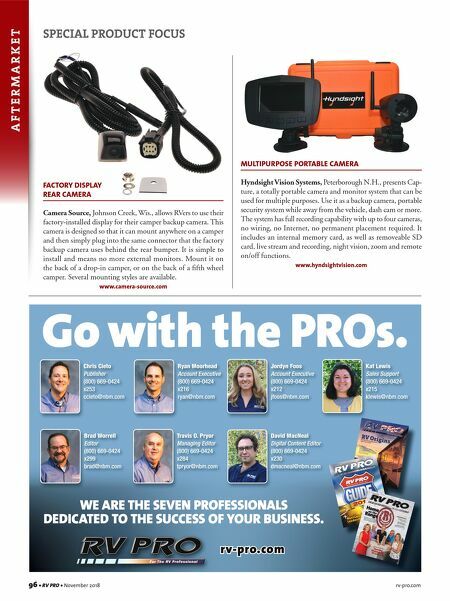 96 • RV PRO • November 2018 rv-pro.com A F T E R M A R K E T SPECIAL PRODUCT FOCUS FACTORY DISPLAY REAR CAMERA Camera Source, Johnson Creek, Wis., allows RVers to use their factory-installed display for their camper backup camera. This camera is designed so that it can mount anywhere on a camper and then simply plug into the same connector that the factory backup camera uses behind the rear bumper. It is simple to install and means no more external monitors. Mount it on the back of a drop-in camper, or on the back of a fifth wheel camper. Several mounting styles are available. www.camera-source.com MULTIPURPOSE PORTABLE CAMERA Hyndsight Vision Systems, Peterborough N.H., presents Cap- ture, a totally portable camera and monitor system that can be used for multiple purposes. Use it as a backup camera, portable security system while away from the vehicle, dash cam or more. The system has full recording capability with up to four cameras, no wiring, no Internet, no permanent placement required. It includes an internal memory card, as well as removeable SD card, live stream and recording, night vision, zoom and remote on/off functions. www.hyndsightvision.com Go with the PROs. 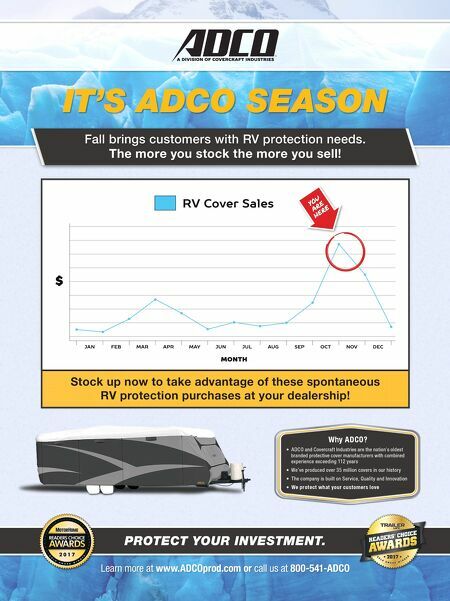 rv-pro.com WE ARE THE SEVEN PROFESSIONALS DEDICATED TO THE SUCCESS OF YOUR BUSINESS.